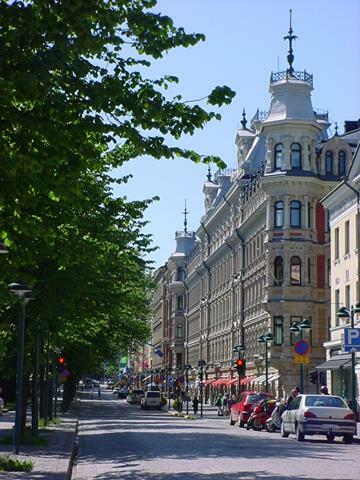 Helsinki in Finland is the second-most northerly capital city in the world (after Reykjavik), being on the same latitude as Anchorage and the southern tip of Greenland. It is still a good 400 miles from the Arctic circle, so the sun sets during midsummer but it doesn't get fully dark, as we discovered. Finland prides itself on having avoided becoming part of the Soviet Union and acts as a buffer between East and West. The border has shifted back and forth over the years, and currently sits to the West of Vyborg, Russia. 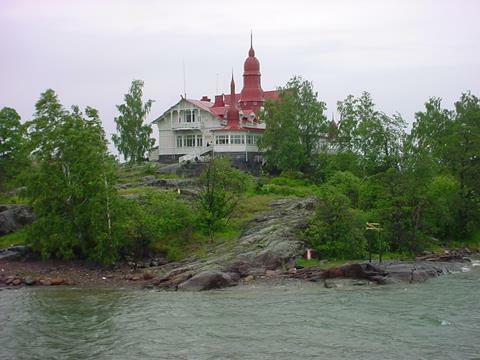 There are about 5 million people in the country, which in Finnish is called Suomi. Finnish is a very different language from Norwegian and Swedish, and is more closely related to Estonian. Finland was the first stop on our Baltic tour 2004, we had a return flight to Helsinki. We spent a night there at the start of the tour where we didn't see much except the inside of an Irish pub for the football, and two nights on the way back. Both times we were staying at the Academica Summer Hostel, student halls which during the summer are hired out to backpackers. The place had a swimming pool and a sauna, the quintessential Finnish experience as of course, they invented it. A cafe in the station square on Mikonkatu, where we had some very spicy pizza. 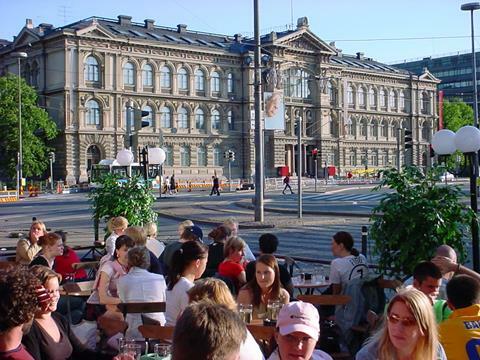 The place in the background is the Ateneum, and is one of the biggest art galleries in the country. Mikonkatu itself is a good street for bars. 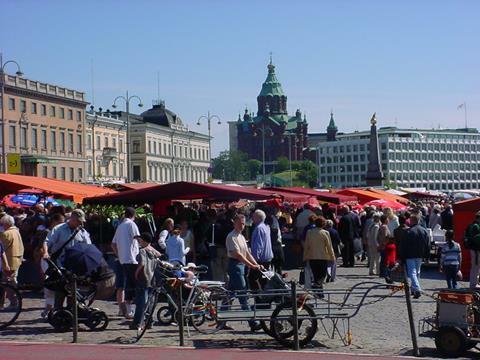 One of the wide boulevards which cuts through the city, with the Esplanade park running down the middle, it is called Pohjoisesplanadi and leads down to the harbour and the market. Helsinki's harbour and market meet here, where things are not really a bargain given that Scandinavian trend for expensiveness! The harbour area and outlying waters are filled with literally thousands of islands, many of which are inhabited by opportune island-dwellers. This was one of many that we sailed past on our way into the dock from Estonia. 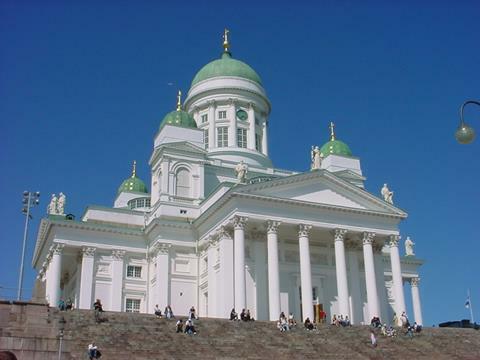 Perhaps the most recognisable of the landmarks in Helsinki is the cathedral on Senate Square, where the University of Helsinki and the government palace are also located. The cathedral was built in 1852, and like most of old Helsinki was built in the empire style popular in St Petersburg at the time. The railway station in the city centre was built in its current form in 1916, and it was from here that Lenin departed for St Petersburg to sieze power in Russia in 1917. 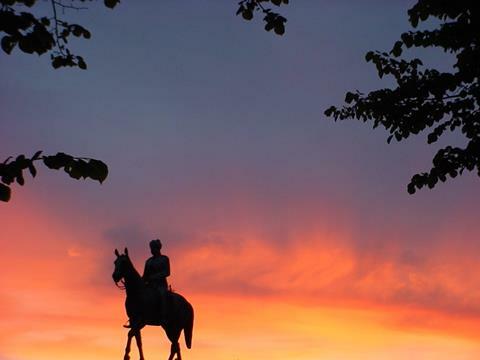 I was surprised, to say the least, when I spotted a lone ranger riding into the sunset, until I realised that it was infact an equestrian statue. I was very pleased with the result of this photo, taken at Mannerheim Square. 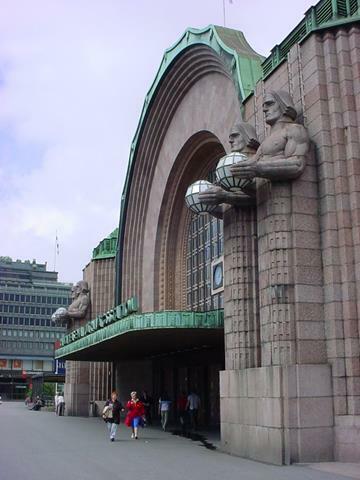 The statue is of Mannerheim himself, national hero and past president of Finland. During the summer solstice festival the Finns tend to go into the country with family for barbeques and a short holiday, but there were a lot of people down at the Helsinki beach at the end of Hietaniemenkatu. All around the coastline and on the islands we could see the glowing bonfires and pillars of rising smoke as people celebrated. Then we jumped into the Baltic Sea. 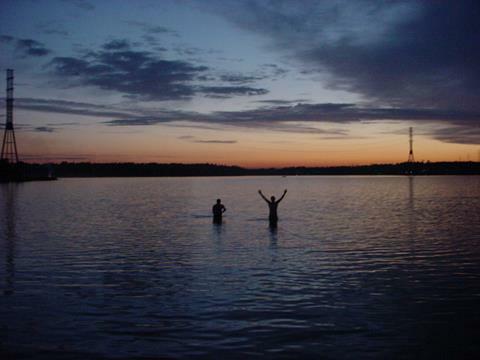 Here we are standing in the Baltic at about quarter past midnight on the 26th of June, our last night in Finland, and what a way to end it!